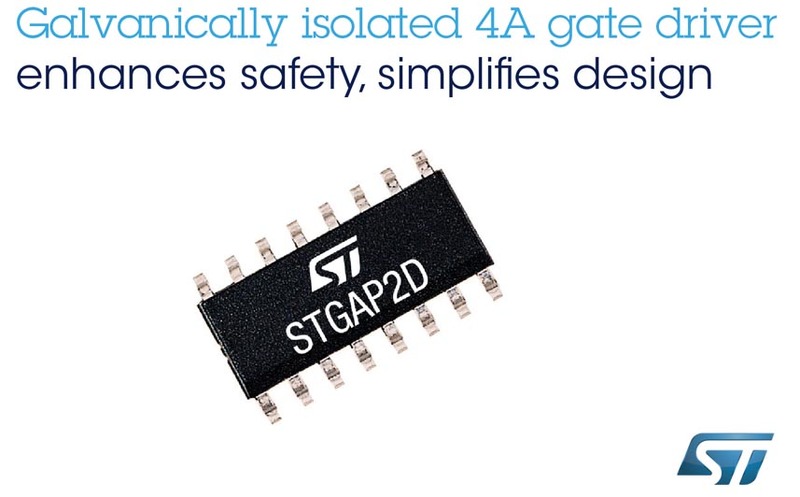 The STGAP2DM gate driver, the second in the STGAP2 series of galvanically isolated drivers from STMicroelectronics, integrates low-voltage control and interface circuitry with two isolated output channels that allow either unipolar or bipolar gate driving. Rated up to 1700 V, the STGAP2DM’s built-in isolation enhances safety as well as simplifying design and saving bill of materials and board space. The two 26 V rail-to-rail outputs with 4 A gate-drive capability ensure strong performance in industrial motor drives and high-power inverters. The STGAP2DM is also ideal for battery chargers, welders, induction heaters, and general-purpose power supplies and converters. Comprehensive built-in safety features simplify system design and enhance reliability, including dedicated Shutdown and Brake pins, Under-Voltage Lockout (UVLO), interlocking to prevent both outputs being high at the same time, and thermal shutdown. A standby mode, controlled by managing voltages on the input pins, lets users save power when the driver is idle. The 3.3 V/5 V TTL/CMOS logic-compatible inputs allow easy connection to a host controller, and input-to-output propagation delay of 80 ns ensures fast operation with high PWM-control accuracy. The STAGP2DM is in production now, packaged as a compact SO-16 device with pinout optimized to simplify board design. Prices start from $2.17 for orders of 1000 pieces. 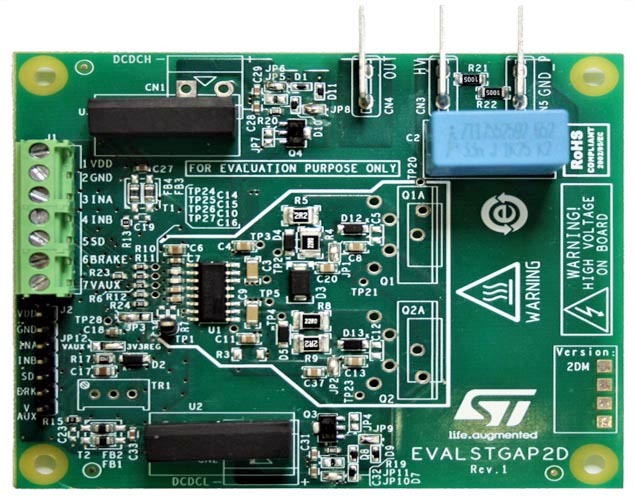 Demonstration board for EVALSTGAP2DM isolated half-bridge gate.